LORD DYING is a band I found via Relapse Records’ e-mail newsletter in 2013. 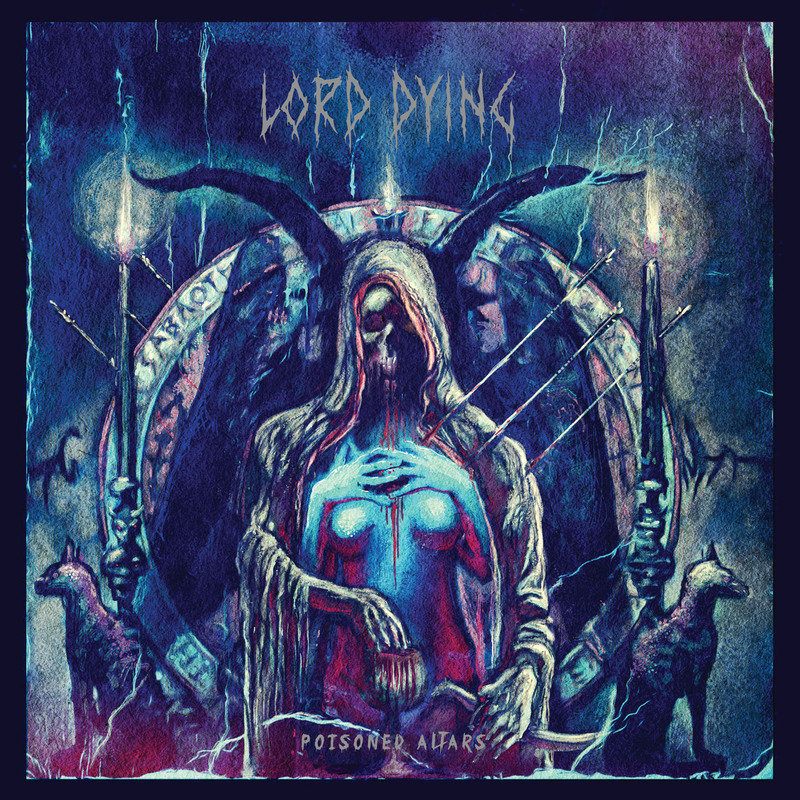 I saw the artwork for their debut LP, Summon the Faithless, it sparked my interest, and I was immediately grabbed by the unstoppable riff machine that is LORD DYING. Their debut record continues to see many trips around my turntable at home. That album left a tall order for their sophomore effort, Poisoned Altars (out January 27 via Relapse Records). However, the band has proven they aren’t out of quality guitar riffs. The record opens with the title track that is relatively thrashy. Erik Olson’s voice comes through angrily in the mix. The chorus vocals and guitar riffs are very catchy and memorable. Consistent with their debut, Poisoned Altars has sludgy guitar tones even during the fastest sections; one of my favorite things about LORD DYING. “The Clearing at the End of the Path” follows and is an overall more mid-tempo number. It goes through higher tempo sections where the guitars standout most, but the hooks lie within the driving, down tuned riffs and Erik’s vocals during those moments. One thing the band has shown continual mastery of is their ability to create crushingly heavy, yet infectious guitar parts. “A Wound Outside of Time” was the first track I heard when the band debuted it last year. This holds as one of my absolute favorite LORD DYING tracks on the LP, and their entire catalog. The introduction is mind-bending with harmonious discord (yes, I know that is an oxymoron, hence why I say it is mind-bending). It’s like nothing I have ever heard before in that it is simultaneously falling in and out of harmony, then intermittently blasting you with chugged, thrashy blows. The song then gives way to some sludgy goodness for the remainder of the song, topped off with a tastefully awesome solo from Chris Evans. “An Open Sore” is also among the favorites. It has a slower moving doom influence for much of it, heavy hitting mostly in its vocal delivery. Part of this is attributed to guest vocalist, Aaron Beam (RED FANG). However this cannot overshadow the contagious riffing in the chorus sections. “Offering Pain (and An Open Minded Center)” ushers in the second half of the record in an epic fashion. The riff begins, allowing Nickolis Parks’ drumming to dictate the buildup of momentum thereafter. Featuring another great guitar solo, the song takes on another life shifting gears to a more aggressive feel nearing the end. Again, Erik’s vocals sound pissed off and massive here. “Suckling at the Teat of a Shebeast” is the absolute thrashiest song on the record. It opens with blistering guitars and guest vocals from Poisoned Altars producer, Joel Grind (TOXIC HOLOCAUST). Another standout, this song will be a crowd pleaser on tour (cue the circle pits). Not only is it aggressive in speed, but the guitar solo beginning at 2:37 is the most technical and shred-centric I’ve heard from LORD DYING. “(All Hopes of a New Day)…Extinguished” follows, delivering a clinic in sludge. It is 5:02 of a slow, precise beat down. Don Capuano’s bass seemed to stand out most to me here, as it adds what sounds like a ton to the thick, gritty foundation of the song. “Darkness Remains” is a perfect album closer. It is the longest song on the record at 6:53 and is multifaceted. It’s like taking every element that comprises the LORD DYING sound, and putting them into one epic composition. There are incredible guitar harmonies, doom sections, a stellar guitar solo, thrash sections, and riffs for days. The track fades into noise that carries the LP to its end. LORD DYING does not fall into the sophomore slump with Poisoned Altars; it is every bit as strong as its predecessor. The riff factory quartet keeps writing top notch material, maintaining their foundation while exploring new musical ground. Their sound has evolved from Summon the Faithless, forging ahead in a great direction. If you haven’t familiarized yourself with LORD DYING, it’s time to worship at your Poisoned Altars.